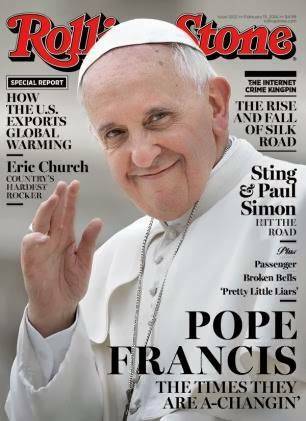 GMA News Online reports that Pope Francis has become the first pontiff to grace the cover of Rolling Stone, considered as one of America’s "most venerated chroniclers of youth and popular culture." The report noted that the magazine cover shows a close up photo of the Pope smiling and waving. The tag line beneath his name, "the times they are a-changin'," was a reference "to Bob Dylan’s landmark 1964 song and album that marked the start of a youth counter-culture that spread throughout the globe, including the Philippines." The cover story written by Mark Binelli has been seen by many readers as a positively glowing profile on the pope. A passage of Binelli's 7,700-word article described Pope Francis as a man "whose obvious humility, empathy and, above all, devotion to the economically disenfranchised has come to feel perfectly suited to our times."